KathyB's Little Corner: I am shocked, amazed and thankful! Thank you Lee Ann at Crafty Side of Me for this amazing blog award, this was so very kind! I appreciate everyone that stops by for a peek at my little corner. I have only been working on my blog for a couple of weeks now and am truly enjoying it. 1. I work in the emergency communications field as a Communications Supervisor for a statewide emergency dispatch and resource coordination center. 3. I raised five children, four of my own, one step son and sent one child to live in heaven 25 years ago. 4. I have been raising one of my grandsons for the past 2 years, I hope to have the adoption finalized by December 2010! He will be 3 in a few months! 5. I collect fairies, lighthouses and Roman/Grecian times items (chariot sculptures, tins with those themes on them, gladiator type figurines, etc). 6. I love to host get together's at my home for family and friends. If it's not a "holiday" we call them "just because days"
Now it's my turn to give out some of these blog awards. 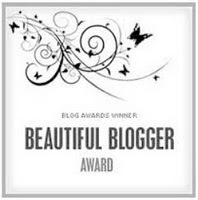 The award asks that the recipient give this award to 15 other bloggers and/or followers. Congrats to all of you! I will posting on your blogs soon! All we ask is that upon receiving this award you give thanks and link the person who sent you this award; also list seven things about yourself (we want to get to know you better) and pass the award on to 15 other bloggers and/or followers. Thank you Kathy - just saw your comment on my blog about the award - thanks so much!